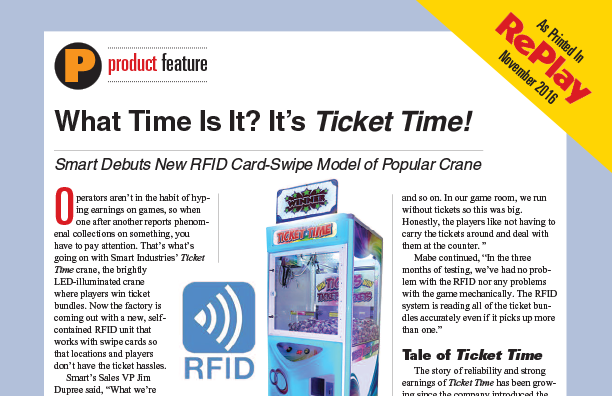 Ticket Time® with Ticket-SmartsTM - the first crane compatible with RFID chip technology. to read RFID chips on ticket bundles. This addition to Smart's Ticket Time® Cranes makes them even easier and more profitable to operate! 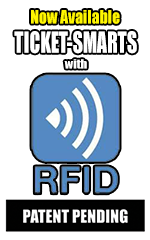 An integrated RFID system that reads ticket bundle values and adds them to players' swipe card automatically instead of dispensing them. Order your new Smart Ticket TimeTM Crane and tell us you want it with "Ticket-Smarts"TM. See the full article from RePlay magazine! "It is by far the best game of 2016 without question! 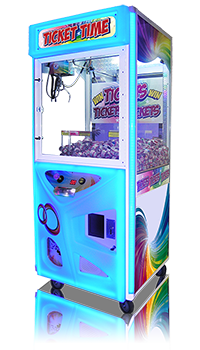 We love the Ticket Time® crane, but we also felt we needed something that didn't dispense actual tickets and instead kept track of the winnings on a player card. The Ticket Time® crane with Ticket-SmartsTM has done as well as the original Ticket Time® without the hassles of dealing with tickets, dispensing, counting, and so on. In our game room, we run without tickets so this was big. Honestly, the players like not having to carry the tickets around and deal with them at the counter." "I bought a single Ticket Time® 10 weeks ago and it's been #1 in the room ever since. It paid for itself in a week! The numbers are nuts. For the money, it's the best game we've ever bought by far! It's also been incredibly reliable: We haven't had any problems with it at all. "It literally paid for itself in 1 week." "Ticket Time® makes more in a day than most of my games make in a week. The game has been the number one machine in my Riverside, CA Mall location since it was installed." "In 28 years I've never seen anything so simple make so much money." "I would recommend it for any FEC, it is a must have." "Beautifully designed, excellent earnings, and good ROI."